Linen makes a strong warp. Known for strength and longevity, linen cloth endures for years and years. It is almost impossible to break a linen thread with your bare hands. Why, oh, why, then, is it so easy to break linen warp ends while weaving?! One reason: Abrasion. Linen is like a gentle heart. It needs to be cared for and nurtured; but don’t underestimate the underlying strength. Five shuttles with colorful Brage wool yarn, each one waiting its turn as weft in the bound rosepath weave. The 16/3 unbleached linen warp, completely hidden in this weft-faced weave, gives lasting strength and stability to the cloth. At the start of this bound rosepath project I had several linen warp ends break at the selvedge. The weaving was drawing in; consequently, the ends at the outer edges were receiving abrasion from the reed, causing the ends to fray and break. So, I began using more weft for each pick, by increasing the angle of weft in the shed. By doing this, I stopped the excessive draw-in. This simple correction made all the difference. No more broken warp ends. The reed is not a threat when appropriate weaving practices are in place. Stay gentle, my friend. Gentleness feels; so be aware of the abrasion, and make corrections. Don’t allow bitterness or disappointment to linger from times of hardship, wearing you to the breaking point. The people in your life need your gentleness. Gentleness is the underlying strength of satisfying relationships. May your most important relationships gain strength because of your gentleness. Those deep rich colors just draw me in. I love this project, and have enjoyed watching the progress you are making on it. I especially appreciate the reminder about gentleness. I very much needed this message today. Thank you, Karen. I wrote these thoughts about gentleness as a reminder to myself, really; so I’m glad it touched a chord with you, as well. Karen, beautiful words… and a beautiful analogy to keep in mind for daily living. I can’t wait to see your bound weave project. 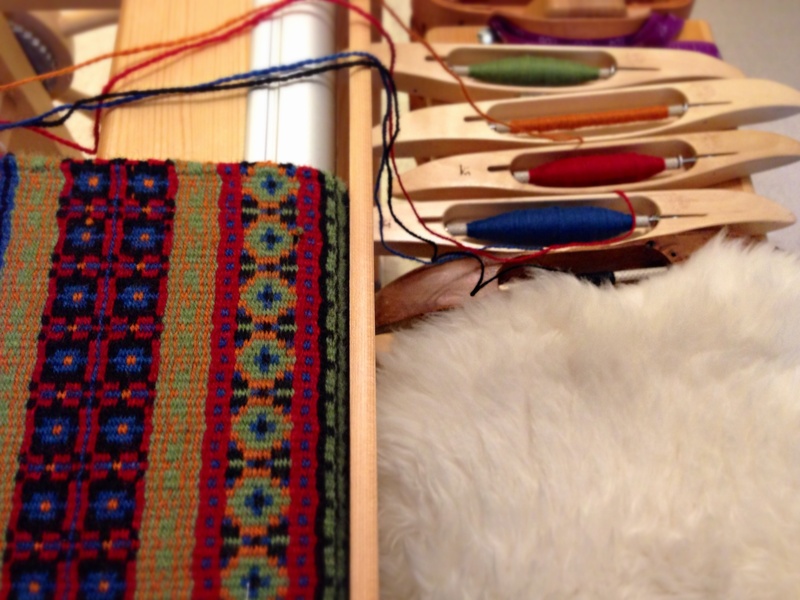 Happy weaving. Hope to see you soon. Hi, Gretchen, I am excited to say that this bound rosepath came off the loom last night! I’ll have pics soon. And I hope to see you soon, too, and show it to you in person. I’m glad the words were meaningful for you.